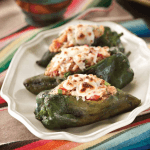 Chipotle Potato Stuffed Poblanos | JPMA, Inc. This recipe is great for a festive breakfast, dinner, or a family gathering. Put poblano peppers in the oven and broil for a few minutes on each side to blacken skin. Place in a small paper bag and fold over the top; let stand for 5 minutes. Cooking or steaming peppers for too long will make them fall apart. Rub off skins and very carefully cut open and remove seeds, leaving stems attached. Place on a small baking sheet and set aside. Place potatoes in a medium bowl. Cover and microwave on high for about 7 or 8 minutes or until potatoes are soft. Mash well. Stir tomato, green onion, salsa, chipotle pepper, and adobo sauce into mashed potatoes. Spoon about 2 ⁄3 cup potato mixture into each broiled pepper and sprinkle each with a tablespoon of cheese. Broil stuffed poblanos for 1 or 2 minutes or until cheese is melted. Use Oaxaca cheese instead of Asadero cheese.